Whilst a little bit of worry, stress and anxiety is normal when you are pregnant, if this gets to the point that it is causing you to worry excessively on most days and significantly affect your life – it is possible that you are experiencing an anxiety disorder. I didn’t know you could get anxiety DURING pregnancy. Any mood swings I put down to hormones. Anxiety disorders are the most common type of mental health problem – affecting one in four people in their lifetime. Whilst the exact rates of anxiety in pregnancy are yet to be confirmed, this is thought to increase in pregnancy (and in the moths after the baby is born). Despite being common however, often the symptoms of anxiety are overlooked, interpreted as part of the general symptoms of pregnancy, or just considered part of someones ‘organised personality’. I never really realised it before, now that I think about it I guess I was a bit over anxious and teary in the last few months of pregnancy. I was happy to be pregnant and looking forward to having the baby but I was worrying about everything from finances to the baby’s health. As a result often these symptoms are not recognised at the time, but only in hindsight or even following birth when other stressors may also be impacting on your emotional wellbeing. It was only after the birth of my second child that I realised how unwell and how bad the anxiety was during my first pregnancy. It really surprises me that no one picked up on it. Some women who previously endured pregnancy loss also describe feeling anxious during subsequent pregnancies. This is completely understandable and important to discuss with your health professional as part of your antenatal care. I am certain my anxiety stemmed from unsuccessful pregnancies and my fear I would lose this one, and I can’t imagine I’m alone in that, when there have been multiple miscarriages. panic attacks – which are outbursts of extreme fear and panic that ‘take over your body’ and feel out of control. Sometimes this leads people to start avoiding situations for fear it may reoccur. When reviewing the range of symptoms – some affect us physically (e.g. constant tension, lack of sleep, feeling restless or on edge), others affect us mentally (having thoughts that something is wrong or something terrible is going to happen). In turn, these thoughts and feelings can impact on our behaviour (what we do) such as checking to seek reassurance, or avoiding people or situations that have made us feel uncomfortable. Living with the constant symptoms and trying to manage the intrusive, anxious thoughts can be exhausting. 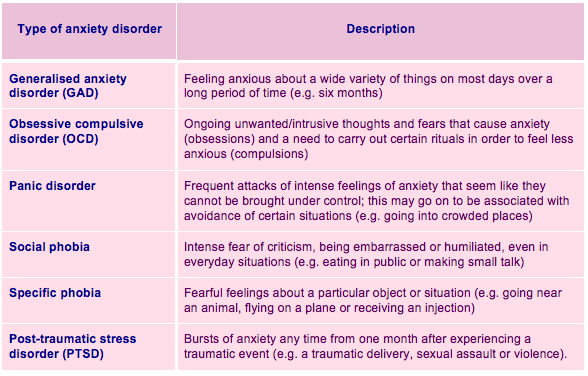 There are a number of different types of anxiety conditions, each of which has a different set, or cluster of symptoms. Sometimes these symptoms can develop gradually over time, or they may come on suddenly and intensely. As time goes on, if these symptoms are not identified or treated they can get worse – even to the point that you cannot function as the anxiety has in effect ‘taken over’. People who have experienced anxiety in the past, may find that their symptoms return or get worse during pregnancy. It is only having been through PND that I realise I was very anxious and worried constantly during my pregnancy as well. Although I had a ‘medically’ excellent pregnancy I never enjoyed the experience as my mind was busy analysing and stressing about every little thing. I am a worrier but feel that this was certainly amplified during pregnancy. I had no understanding or idea of antenatal anxiety and depression. The important thing to remember however, is that you are not alone, and that there are safe and effective treatments available. The faster you get help for anxiety – the sooner you can get these anxious thoughts and feelings under control, so that you can get on with enjoying your pregnancy.